Will Whitman Help HP Find Its Way? In announcing that Meg Whitman would become the new CEO, the HP board called her a "technology visionary with a proven track record of execution." She takes the reins as the company's market value falters and it weighs whether to shed its PC business. Will Whitman Help Hewlett-Packard Find Its Way? One of the worst-kept secrets in Silicon Valley was made official Thursday: Former eBay CEO Meg Whitman is taking over at Hewlett-Packard. In making the announcement, the HP board called Whitman, a "technology visionary with a proven track record of execution." She replaces Leo Apotheker, who lasted less than a year on the job. Apotheker is the third CEO that HP has let go in six years. The former CEO, Mark Hurd, was forced out a year ago in a squabble over ethics and improper expense reports. Since Hurd's departure, HP's market value has shrunk by $60 billion. Apotheker didn't help things when he announced last month that HP, a name virtually synonymous with quality PCs and printers, might — or might not — get out of the hardware business and focus on software. Jeffrey Sonnenfeld, a dean at Yale's School of Management, says that announcement confused everyone — customers, suppliers, vendors, employees and shareholders. "There was a term — 'the HP way' — that you may recall, that was industrial folklore in a good way," he says. "There was a certain mythic imagery of what HP stood for in terms of the quality of the product and the management of the organization. Well, that's all gone. The HP way? They've lost their way!" And that's a popular view in California as well. Ashok Kumar, an analyst at Rodman & Renshaw, had even harsher words, calling HP "a clown without a circus, a tragicomedy." It's really unfortunate because you have a company that is iconic of [Silicon Valley] and it's becoming increasingly a laughingstock. "It's really unfortunate because you have a company that is iconic of the valley and it's becoming increasingly a laughingstock," he says. "And it does damage the morale of the rank-and-file HP employees." Kumar says even if you question Apotheker's strategic decisions, he had to be acting with the implicit blessing of the board. "And so to blame the current CEO for its woes is unfair," he says. Enter into this saga Whitman, who is getting her second shot at a second act. She's legendary for having taken over eBay when it had a few dozen employees and $86 million in revenues. Under her leadership, eBay became a household term earning almost $6 billion in revenue. Then she got the idea to run for governor of California last year. "We can fix California, no question about it," she said. "It's going to take a different style of leadership, a different approach, but we can make California great again." Running as a Republican, Whitman spent more than $170 million, almost all it her own money. That was a record amount for any statewide office in the country. But she lost to an ageing former governor, Democrat Jerry Brown, by 13 percentage points. 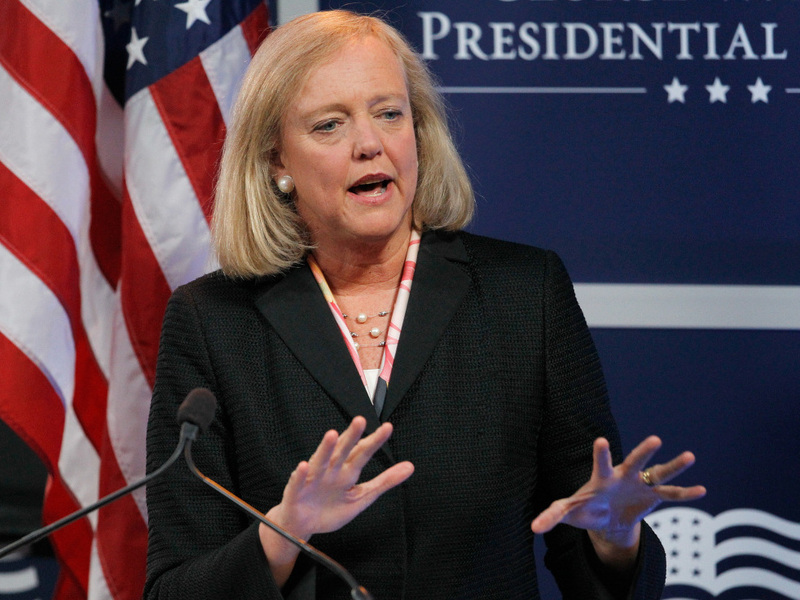 Now as the new CEO of HP, Whitman will be the second woman to run that company. The first, Carly Fiorina, lost her bid to represent California in the Senate last year, too. Sonnenfeld says Whitman has many qualities that might help her succeed in turning HP around. He says she's entrepreneurial and resilient. "She's gotta make strategic sense of this business, and she might be able to pull it off," he says. "She's a capable communicator; she could have been better in the campaign but I think she's learned a lot from that process. And she's not an ideologue. She's not Carly Fiorina. I think she has the capability to learn from where her mistakes were and she can do better." But Sonnenfeld says another challenge for Whitman is doing what her three predecessors failed to do: deal with a board of directors that he calls "poisonous."